This time, our dynamic duo (our 7 lb. delectably glazed HoneyBaked Half Ham & our 3 lb. 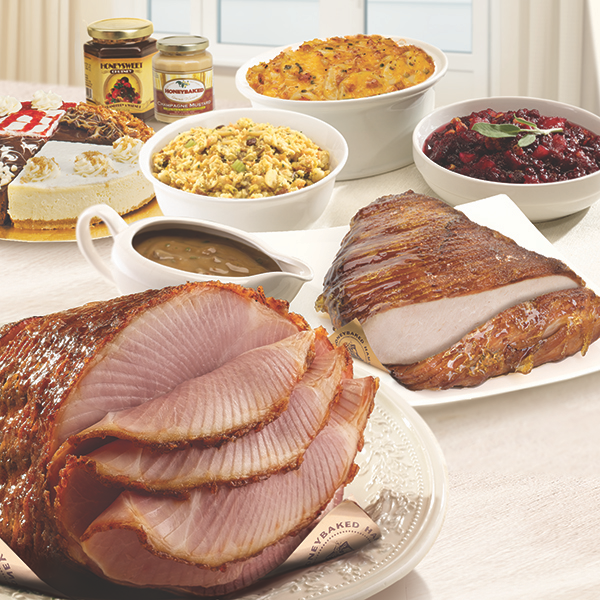 sliced and glazed Oven-Roasted Turkey Breast) is accompanied by our versatile 4-flavored cheesecake and some fantastic side dishes. With 2 quarts of our hearty Cheesy Scalloped Potatoes, 2 quarts of our famous Made-From-Scratch Stuffing, 2 quarts of our Cranberry Salad, 1 quart of our rich, Turkey Gravy, one of our gourmet mustards and a jar of our Cranberry Walnut Chutney. This Combo will please everyone at the table.